The new club on the block has potential, but best to visit on a Saturday night. All you can drink table service is also an attractive option for those who don't want to visit the larger clubs. I’ve got an invite to new club opening at the ATT4FUN complex – It’s called Hive Club. I’ve missed the grand opening night but I’m here for the Invite Only event before public launch. Let’s check it out! Fridays @ Hive Club, Taipei, Taiwan. 1st Floor, ATT4FUN complex, at the Taipei 101 building. Best to taxi it here. Or MRT and walk from Taipei 101 station. Same promoters / company as of Myst nightclub. Open since December 2013, Hive club is open Tuesday nights to Sunday nights. Take that Monday off to recover. Fridays, Saturdays it is recommended for both ladies and gentlemen to wear at minimum smart casual. Ladies get free entry before 23:00PM. Passouts allowed, you get a stamp. In taipei you usually order a table and pay for some bottles, but here these guys offer “All You Can Drink Tables”. The cost being $2000NTD/8 people, $2500/12 people, $3000N TD/15 people. ). This includes entry to the club. Entry from the ground floor is via a large elevator. Theres even room for a mini-bar in the elevator. The most impressive nightclub elevator in Taiwan, lol. As you exit the elevator, enter the right side of the club. Tables line the sides of the club. 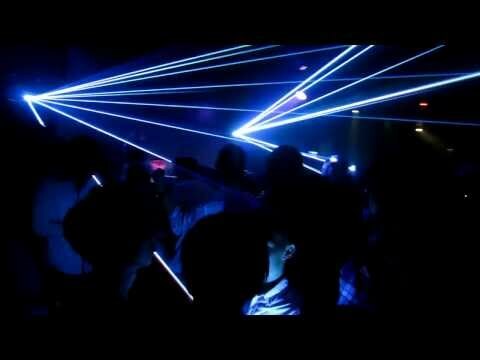 Right in the middle is the dancefloor. 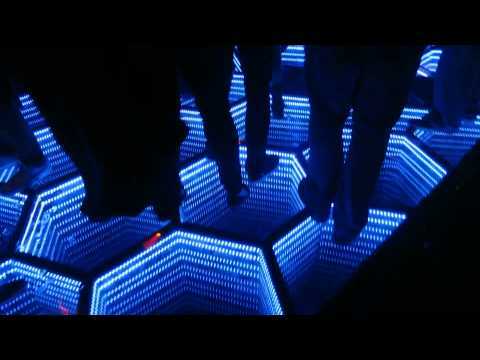 The floor is a see-through dancfloor, with the glowing pattern of honeycomb beneath. It’s pretty fancy but you get over it soon. The columns that hold the club in place are covered in glowing red lights. The dance floor can hold about 100 people while the tables can hold 300 or so people. The bar is located in the far left corner. The bar is in the shape of, surprise, a hexagonal shape. Disappointed. Only 2 cubicles and four urinals. THERE WAS A LINE FOR THE GUYS. Enough said. Tonight it’s friday Hip Hop night and they love to play it loud. It’s okay for what it is, people seem more concerned with drinking. Being VIP night, it was mostly regular clubbers here who are dressed well. Almost everyone here received invites by clubbing at Myst. Mostly mid-20’s to 40’s here. Pretty much all locals here, but probably only because it was the first week of opening. I pretty predict that as the club gains recognition over the next few months the crowd will shift towards of a mix of foreigners and locals, but mostly locals. Early in the night there are dancers prancing about on the podium areas. The dancing area is distinctly segregated from the general table service areas. It was pretty dead when I got in (12:30AM, right), and nobody was on the expansive dancefloor. So me, slightly intoxicated, jumped up and danced and tried to get my friends up. They aren’t too keen. So I managed to get some other random Taiwanese local girls up to dance. Pretty much within 15 minutes the whole dance floor becomes packed. You’re welcome. At around 1:45AM police come in and pause the entire club for ID checks. This is the first time it has happened to me, but I’ve been told it is quite common. It takes about 15 minutes to check everybody’s ID. Even the bar is closed during this time. It’s a major mood killer. Around 2:00AM the place started to empty out.. fast. 2:30AM it was pretty much empty bare 4 people including me. Time to go. The drink deals are a steal, but in terms of size and grandiosity you should go for sister club Myst. However on its own standing, Hive has some great potential as long as the crowds keep coming in.